Jesus clearly taught that without the new birth there is no salvation. You’re religion can’t save you. Your church can’t save you. Your belief system can’t save you. Unless a person is born again, Jesus said, no one can enter the kingdom of God. “Jesus answered and said to him [Nicodemus], ‘Truly, truly, I say to you, Except a man be born again, he cannot see the kingdom of God. “ – John 3:3. Nicodemus was a devout religious man. He was a ruling member of the Jewish Sanhedrin and teacher in his church. He kept most of the Bible commandments and practiced a holy life. Yet when he came to Jesus, He was told by our Lord that He was lost! In his present spiritual condition he would never enter God’s kingdom (John 3:1-3). Why was Jesus so hard on him? Because Jesus discerned that he was not “born again”. He was a good man and deeply religious, but he had never experienced the new birth. Without the new birth there is no spiritual life. You may be physically alive, but you are still spiritually dead in your trespasses and sins. “And you has He [Jesus] quickened [made spiritually alive], who were dead in trespasses and sins…” – Ephesians 2:1. How often I have met people in the Christian church with the same kind of spiritual issues as Nicodemus. They say they believe in Jesus, go to church, read the Bible, keep the commandments, but yet they are just as lost as Nicodemus was. Why? Because they are following a religion instead of following the Savior. The only way to be sure that you are saved from your sins, have eternal life with God and truly born again, is to believe on the Lord Jesus Christ and commit your life to Him as Savior and Lord. 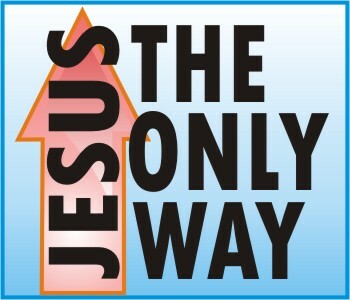 He is the only way to God and the only One that that can give you new spiritual life. If you just prayed this prayer and accepted Jesus Christ as your Savior and Lord, you are now born again. Write us and let us know of your decision to follow Jesus and let us rejoice with you. KESIA likes this on our Facebook page. PIERRE likes this on our Facebook page. CYNTHIA SPINNER likes this on our Facebook page. Categories: MESSAGES, The Only Way to God | Tags: Born Again, Born from above, Entering God’s Kingdom, Ephesians 2:1, Eternal Life, Holy Spirit, Jesus as Savior and Lord, John 14:6, John 3:3, John 3:5, Life, New Birth, Nicodemus, Only Mediator, Only way to God, Religious But Lost., Romans 8:11, Salvation Message, Spiritual Life, The Way, Truth | Permalink.